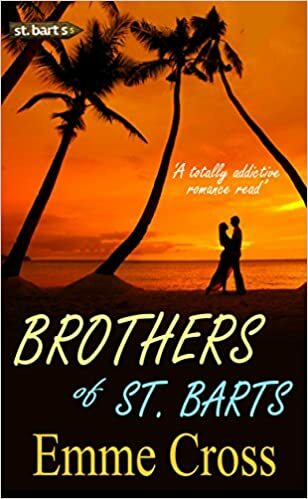 Brothers of St Barts. Emme Cross. Book six, another great read from Emme, with tears and laughter. This feels like closure to me for Sven and Sunny, and though I think there are more books planned I really hope they are about other characters from the series, as to me Sven and Sunny are at the top of their story, and more will just spoil what’s been a great read for me. Always Stop at the Top, whether its a book, TV series or an individual actor….. Anyway here we are in Norway, with Sven between films and busy scriptwriting among other things, and Sunny expecting their next baby. They seem so happy but underneath that is a huge secret about to come out and tilt that on its axis. Not only on a personal level, but something that the media – those who love to drag good people down – will seize upon and wring out the last drop regardless of the effects on innocent characters. You can tell how much I love the cult of all things celebrity and the media vultures! Sunny’s been through so much, Sven finally grown into the man she needs and that is all potentially threatened. Sven’s friends from university Stellan and Astrid are here, along with her two boys are here, Sven’s mum Judith loves having her family back in Norway, and there’s more from Linus. And the dogs of course, Sponge and Frigga! Its a shortish novel once more, but follows on perfectly from the last book, and is a fabulous read. It’s easy to follow the story, which is packed with glorious recipes that made my mouth water, and of course Sunny as ever is the star. She’s so full of energy, fun characterising everything she does, and the love for her family and friends just spills out. She’s the person I would love to be in real life. There’s drama here but it’s gentle, a more cerebral “what can we /shall we do” type, rather than the life threatening events of the past. Stars: a Five once more and a series to treasure and read when the sky is grey and you need some cheering.